Those of you who know me know that I have recently returned to dressmaking after a gap of some years. It is a hobby I always enjoyed but I have never been certain I am actually any good at it. Whilst winter had us in its grip I decided I needed to book some treats to look forward to and one of them was a sewing retreat run by Sew Different. 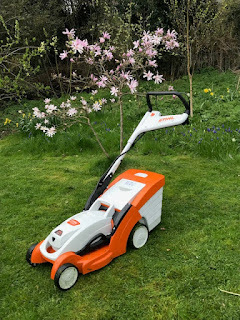 If you want to know more about the sewing of the weekend then this is covered in my sewing blog: Neytorin Sewing Exploits. There was a small amount of time before I left for home that I could use to explore the venue for the retreat, the rather wonderful Cannon Hall which is close to Barnsley. The story of Cannon Hall is similar to many country homes. Its roots go back to the 14th century and its heyday was in the 19th century when many alterations were made to the house and gardens. For generations it was owned by the Spencer-Stanhope family. By the 1950s it was in decline and bought by Barnsley Corporation. Since 1957 it has been a museum. There is also a Farm Shop on the same site. It is a very good farm shop. I was pleased that there was enough time to explore the gardens. First thing I noticed was that there is a good sized walled garden. The walls have these well trained trees lining them. I always like to see some well trained trees. The walled garden also is home to a large collection of pear trees. There are also these rather fine cold frames. and the gardens are clearly well cared for. As I wandered around I was drawn to the glasshouses, there is the restored glasshouse that apparently houses a 200 year old grape vine. This other glasshouse, at the far side of the garden, is in rather a sad state. It is always heartbreaking to see history crumbling away like this. The Hall is in receipt of Lottery Funding so I am hoping that restoring this wonderful structure is on the list to be tackled. The other glasshouse is wonderfully maintained. 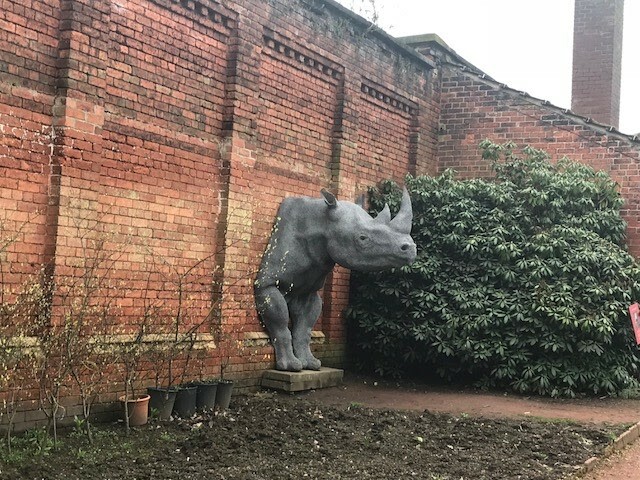 I carefully averted my eyes from the rhino who was pretending to be invisible. I did not have the heart to let him know that his camouflage was flawed. 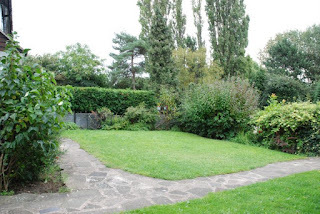 As you wander the paths you become drawn to the doorway to the wider gardens. I do like to be led on a garden journey. There is this sunken bed in front of the remains of the pinery, what an amazing structure it must have been. There are some planted up beds and also these ghost beds, the shapes of what was. The pinery itself is a good ruin, whilst it would be lovely to see it restored it also works as a shell. As I was admiring it a family walked by and they stopped in front of the magnolia to admire it. 'That's a great tree' one said, 'yes its a cherry tree' said another. I restrained myself and moved away. They might not have correctly named it, but they were right, it is a great tree. The wider grounds open out in front of you and there were many families enjoying the open space. There is more to see at the Hall but I did not have time on this trip. I hope to return to complete my explorations. 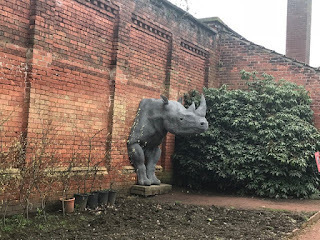 The rhinoceros does really seem like an incongruous thing to have in this garden. I grew up near Cannon Hall, so it has a special place in my heart. It is in much need of repair and it makes me a bit sad to see your post. I remember those ghost beds being full of flowers. Hope they do restore the glasshouses. I remember a sort of gallery of orangeries along that wall, and possibly a pineapplebed?? I do not remember the rhino! !